With only a month to go before Breaking Bad begins its final pass into history, as we just stand there like dopes powerless to stop it, New York’s Museum of the Moving Image is getting a jump on the memorializing with its new exhibit, “From Mr. Chips to Scarface: Walter White's Transformation in Breaking Bad.” As the name suggests, visitors from July 26 to Oct. 27 can see firsthand the costumes and props the series used to mark Walter’s evolution from desperate man to calculating monster—everything from the little white briefs he wore during his first meth cooking session, through his subsequent Hazmat suit and gas mask, and all the way to the black clothes favored by his Heisenberg alias. There’s also ephemera from Walter’s cancer treatment, that pivotal, pool-drowned pink teddy bear, and a copy of Walt Whitman’s Leaves Of Grass that’s been in the bathroom, so that’s gross. (“Underwear And Toilet Books: You Must Really Love Breaking Bad” would perhaps be a suitable alternate title.) And creator Vince Gilligan himself will appear for a talk titled “Making Bad” on July 28, in which he’ll discuss the development of the series while audience members resist the urge to ask him why he has to end it, then. For those who can’t make it to New York, yet still wish to come into contact with some tactile representation of the series they so love without giving in to meth, perhaps you will settle for owning a copy of Heisenberg’s hat? 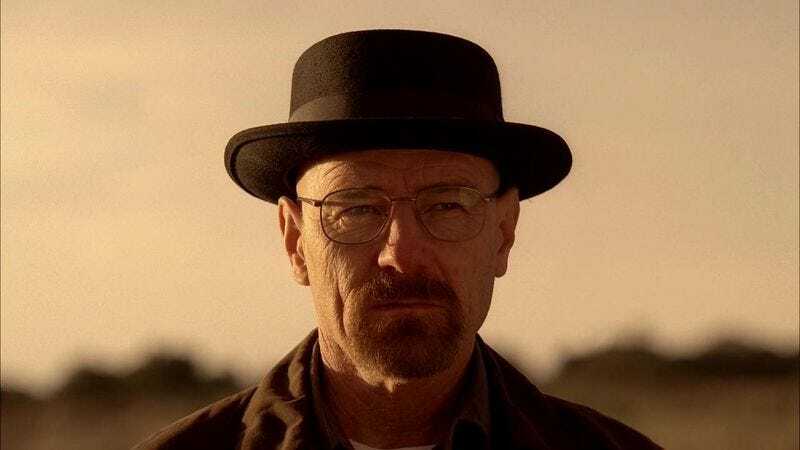 San Francisco-based milliners Goorin Bros. have announced plans to create a limited-run set of black felt Heisenberg porkpies, modeled after the original they produced for the show. The replicas will make their debut at this year’s Comic-Con then roll out nationwide soon thereafter, to be purchased and donned by all the most fervent Breaking Bad fans, would-be drug kingpins, and guys who play saxophone, probably.